I found this cool bug and got a picture of it. It is a walking stick. Click on the picture to enlarge it. Katie from heavytable.com came to our extracting workshop and did an article and took some photos of the day. Here is the link to see the article. You have to scroll down, we are the bottom article. Terry McD had a late season swarm after she took the honey. I have heard of over twenty late season swarms this year. Her video has her troubleshooting the colony looking for eggs, varroa infestation and disease. She had to combine the hive with another colony. I pulled a super of honey off a hive using a fume board and Honey Robber. This is my preferred method of pulling honey. The odor bugs some people but the ease of removal outweighs the odor. In beekeeping timing is everything. Using fume boards is the same thing. I wait for a warm day and plan to pull it then. As always follow the manufacturer's directions when using any product. If you watch this video on youtube it is a bigger screen. Right click on the video and a box comes up click on watch this video on youtube. I pulled a super of honey using a bee brush to remove the bees. This is an easy way to remove the bees off a couple of hives. Teri McD forwarded this link of a video showing the lifecycle of a honeybee then a Varroa mite. It is interesting to see how the varroa can sneak into a larvae cell at just the right time to continue its lifecycle. Hopefully this type of research holds the key to combating this parasite. As beekeepers, understanding how the varroa functions helps us to implement proper controls for minimizing this pest. Here is a link to a preliminary report about findings about possible causes of CCD. In a mixing bowl, cream the first four ingredients until smooth and fluffy. Add remaining ingredients and mix well to make a smooth dough. Chill 10 minutes. Shape dough into 1” balls and roll in additional granulated sugar. Place on lightly greased cookie sheets. Drip 1-2 drops of water onto each cookie. Bake at 375° for 8-10 minutes until golden. Combine the first four ingredients in a saucepan; stir over high heat until the mixture boils. Reduce heat to medium; boil without stirring about three minutes to 265 degrees. Remove from heat; stir in baking soda. Put popcorn into a large bowl and slowly pour on the syrup and stir until coated. Turn onto a greased cookie sheet and bake 45 minutes at 250 degrees, stirring every 15 minutes. Cool and break into serving-sized pieces. Store in an airtight container. Mix equal parts of reconstituted lemon juice and honey. Add water to taste and chill. My daughter made this recipe. It was very good. I thought I would share it. It is a great way to use up the zucchini's. Mix and press 1/2 of the mixture into a jelly roll pan and bake for 10 minutes. Add zucchini and top with the rest of the crust. 1. Make sure the honey is ripe. Capped honey is normally ripe with a moisture level of 18.6% or less. That is the threshold for Grade A Honey. Extract uncapped honey separately. Eat this first before it can ferment. The only way to check the moisture content is with a refactometer. I will check honey at my shop for free. Bring a full container. The amount can be small but the container should be full to get an accurate measurement. I only use a few toothpicks full for the sample. Putting honey supers in a closed room with a dehumidifier running will bring down the moisture level of the honey before it is extracted. 2. A good place to store it. A pail with a lid works great. If the pail has a honey gate that helps for bottling. A open headed pail is a must. If the honey granulates in the pail a open top makes it easier to get it out of. A tight lid keeps the honey from absorbing moisture from the surrounding air. It helps to put down cardboard on the floor before extracting. The cardboard will keep the floor for getting wax and honey on the linoleum. Recycle the cardboard when finished. 4. The day before honey super removal, go out to your hive. Take the supers off the hive. Then rotate them 180 degrees and put them back on. This will break loose any interconnecting bridge comb. By putting them back on, the bees will have a day to clean up any dripping honey. When you take the honey off the next day dripping honey off of bridgecomb will be much less. 5. A note of safety. It is easy to poke the sharp tines of a capping scratcher into one's fingers. 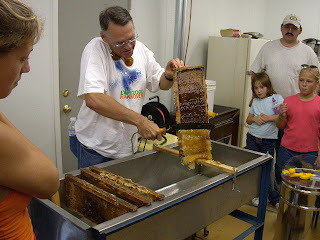 Rotation of a honey extractor can injure fingers and hands. Never put hands into a rotating extractor. The hot knife is hot, hence the name. A burn can happen quickly. The knife is also sharp. Cuts are possible. Extract in a bug tight environment. extracting in an open garage will invite every bee, wasp, and hornet in your county into your garage. Heavy loads. Make a little pallet the size of a supers. Use a two wheeler to move around supers. Our annual extracting workshop is full.